During your next turn, this Pokémon’s Overdrive Smash attack does 60 more damage (before applying Weakness and Resistance). Your Team Plasma Pokémon’s attacks (excluding Deoxys-EX) do 10 more damage to the Active Pokémon (before applying Weakness and Resistance). If this Pokémon has any Plasma Energy attached to it, this attack does 30 more damage for each Energy attached to the Defending Pokémon. Put this card from your hand onto your Bench only with the other half of Rayquaza & Deoxys LEGEND. If your opponent’s Pokémon is Knocked Out by damage from an attack of Rayquaza & Deoxys LEGEND, take 1 more Prize card. 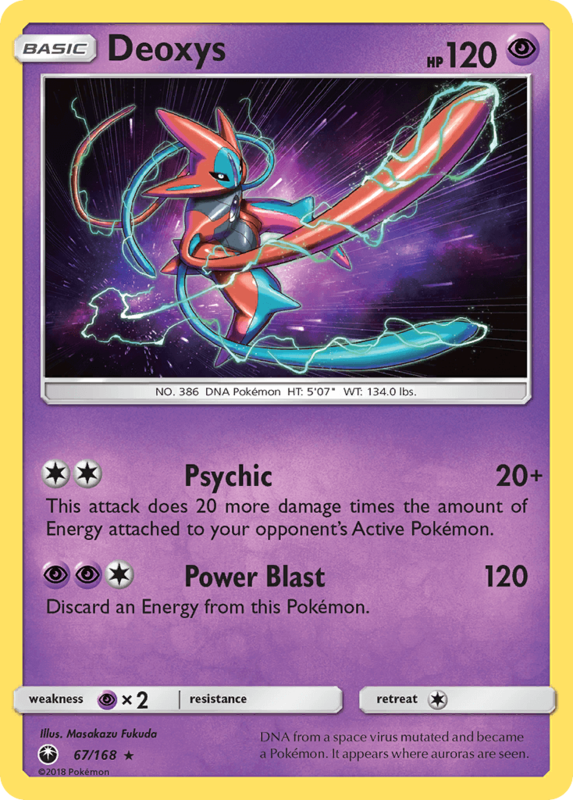 Discard all [R] Energy attached to Rayquaza & Deoxys LEGEND. 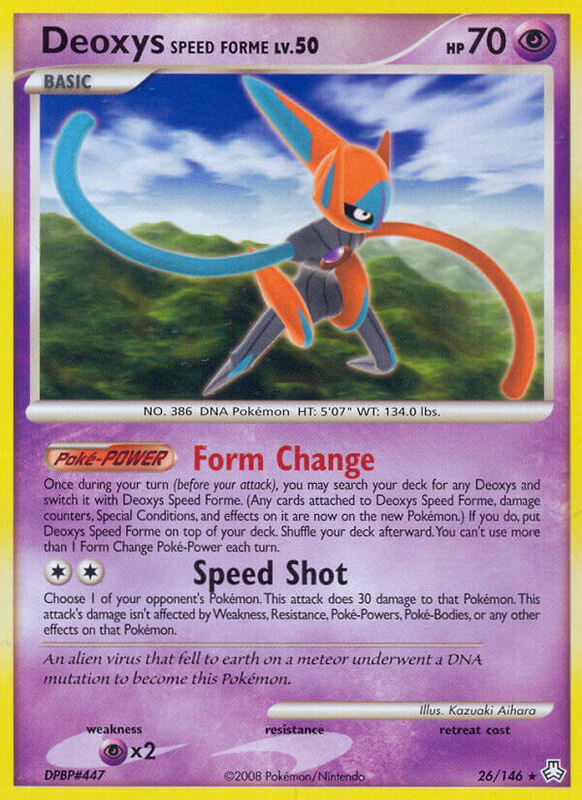 Once during your turn (before your attack), you may search your deck for any Deoxys and switch it with Deoxys Speed Forme. (Any cards attached to Deoxys Speed Forme, damage counters, Special Conditions, and effects on it are now on the new Pokémon.) If you do, put Deoxys Speed Forme on top of your deck. Shuffle your deck afterward. You can’t use more than 1 Form Change Poké-Power each turn. 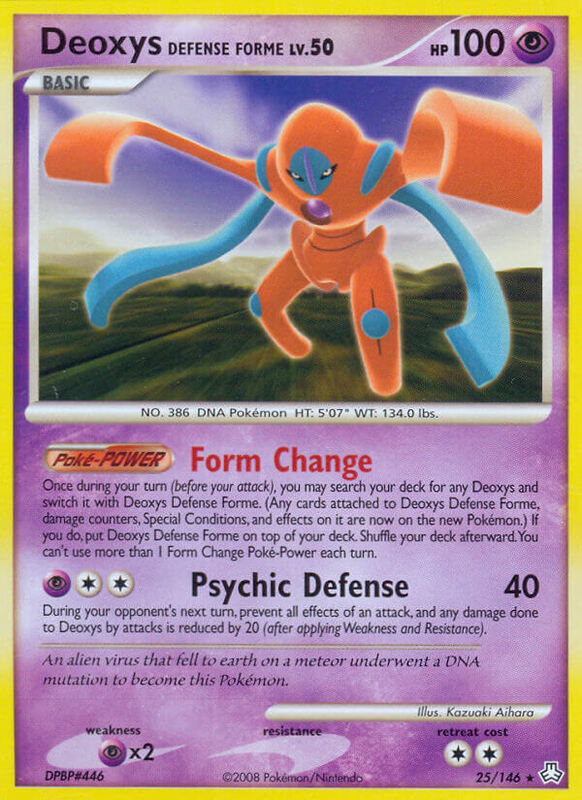 Once during your turn (before your attack), you may search your deck for any Deoxys and switch it with Deoxys Defense Forme. 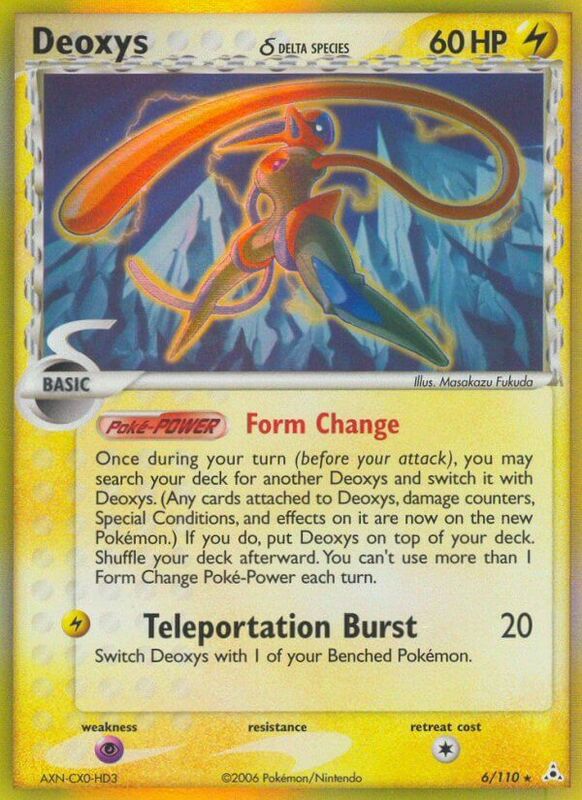 (Any cards attached to Deoxys Defense Forme, damage counters, Special Conditions, and effects on it are now on the new Pokémon.) If you do, put Deoxys Defense Forme on top of your deck. Shuffle your deck afterward. You can’t use more than 1 Form Change Poké-Power each turn. 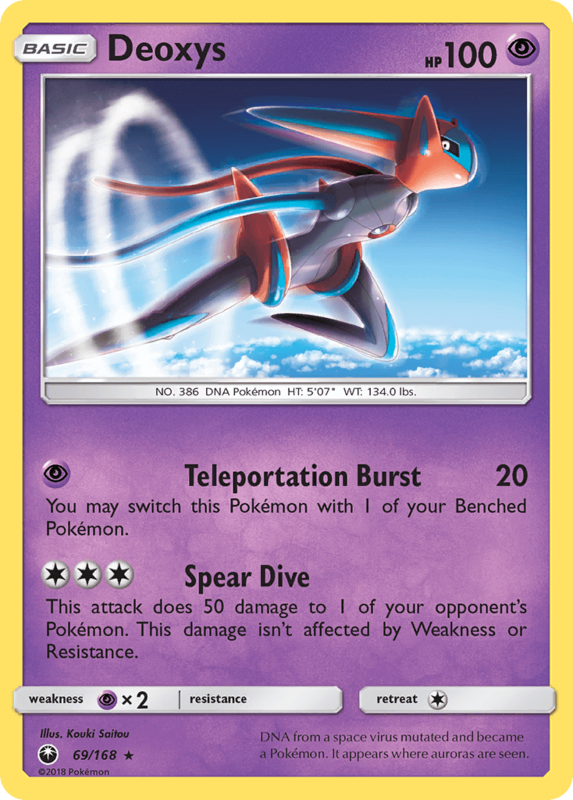 During your opponent’s next turn, prevent all effects of an attack, and any damage done to Deoxys by attacks is reduced by 20 (after applying Weakness and Resistance). 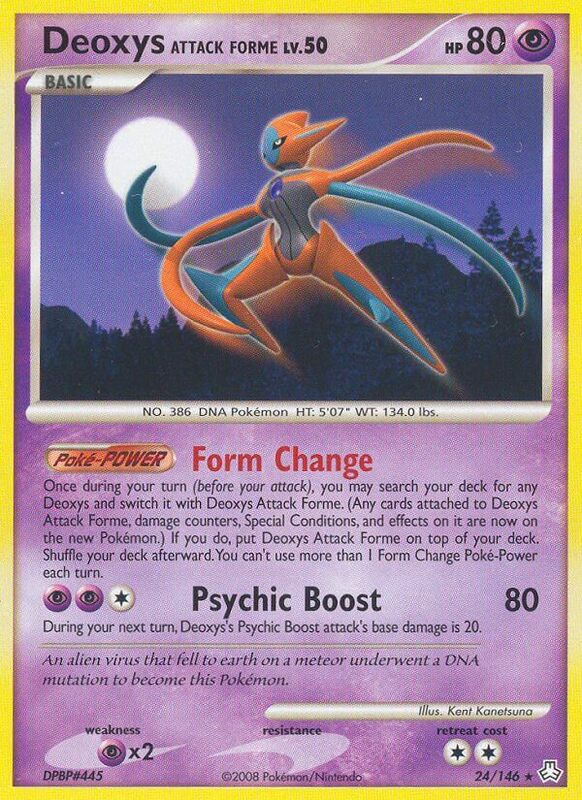 Once during your turn (before your attack), you may search your deck for any Deoxys and switch it with Deoxys Attack Forme. 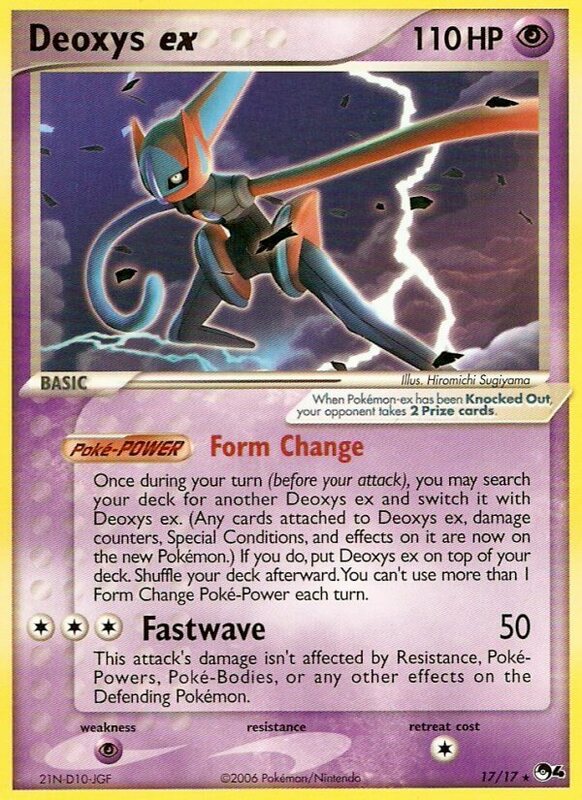 (Any cards attached to Deoxys Attack Forme, damage counters, Special Conditions, and effects on it are now on the new Pokémon.) If you do, put Deoxys Attack Forme on top of your deck. Shuffle your deck afterward. You can’t use more than 1 Form Change Poké-Power each turn. 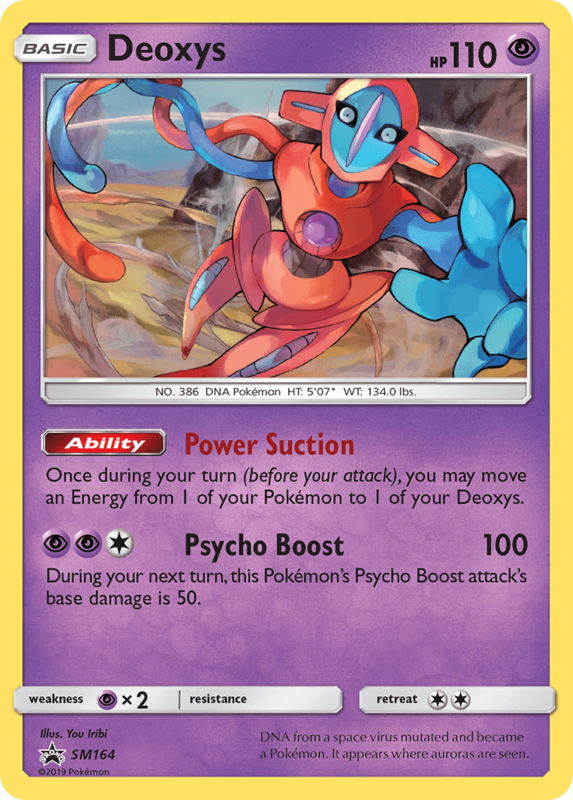 During your next turn, Deoxys’s Psychic Boost attack’s base damage is 20. 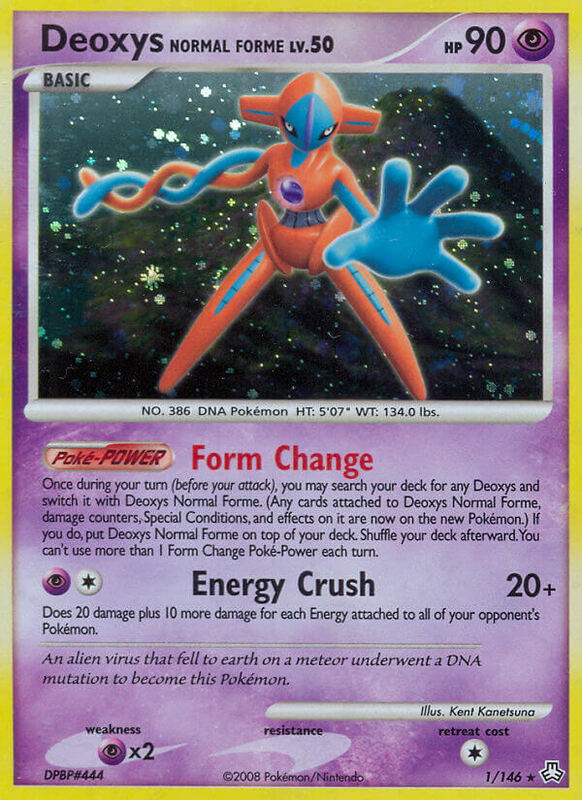 Once during your turn (before your attack), you may search your deck for any Deoxys and switch it with Deoxys Normal Forme. (Any cards attached to Deoxys Normal Forme, damage counters, Special Conditions, and effects on it are now on the new Pokémon.) If you do, put Deoxys Normal Forme on top of your deck. Shuffle your deck afterward. You can’t use more than 1 Form Change Poké-Power each turn. Does 20 damage plus 10 more damage for each Energy attached to all of your opponent’s Pokémon. 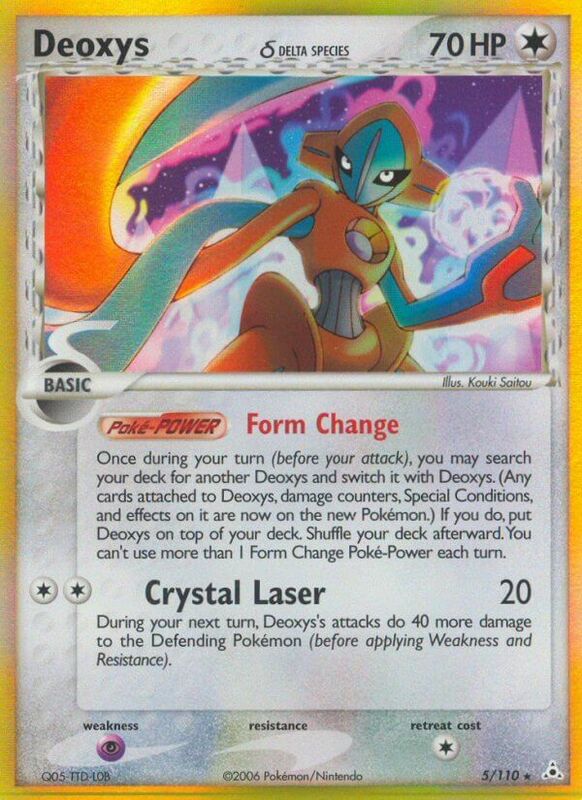 Once during your turn (before your attack), you may search your deck for another Deoxys and switch it with Deoxys. 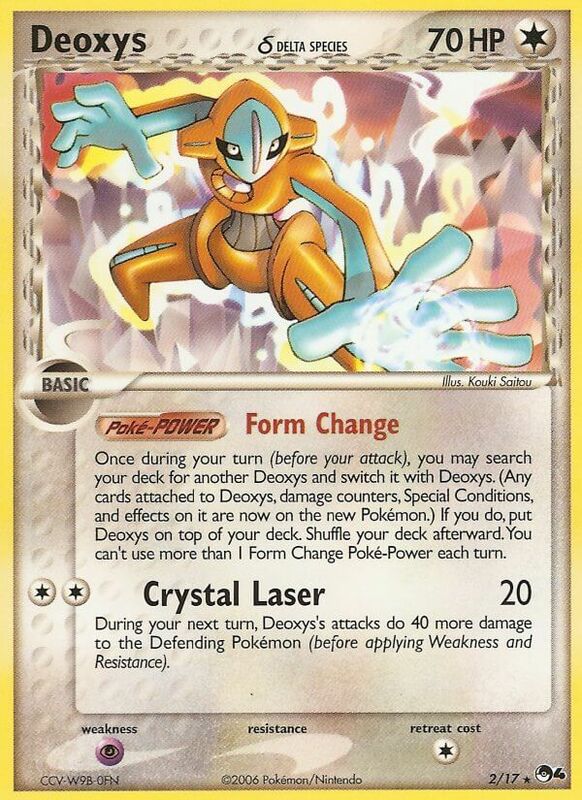 (Any cards attached to Deoxys, damage counters, Special Conditions, and effects on it are now on the new Pokémon.) If you do, put Deoxys on top of your deck. Shuffle your deck afterward. You can’t use more than 1 Form Change Poké-Power each turn. 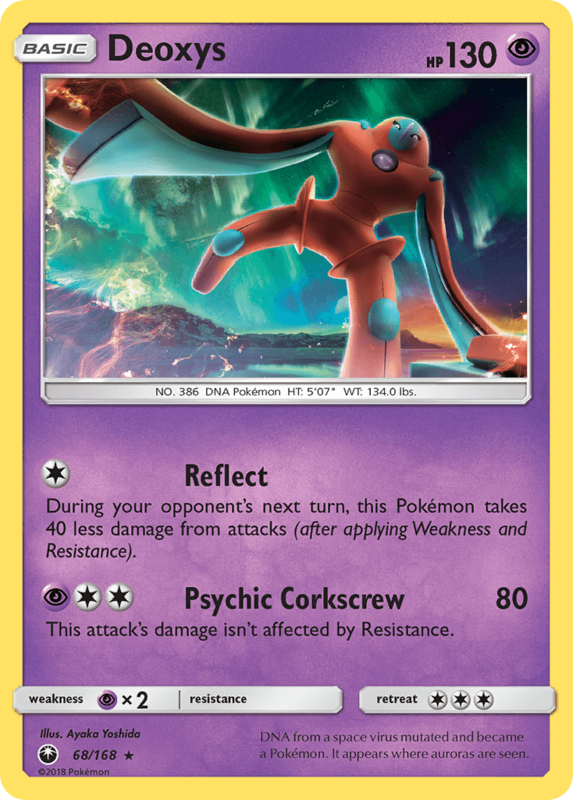 During your next turn, Deoxys’s attacks do 40 more damage to the Defending Pokémon (before applying Weakness and Resistance).